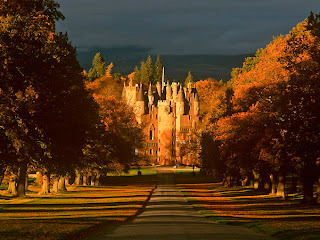 Glamis Castle is in Glamis, Angus, north of Edinburgh. 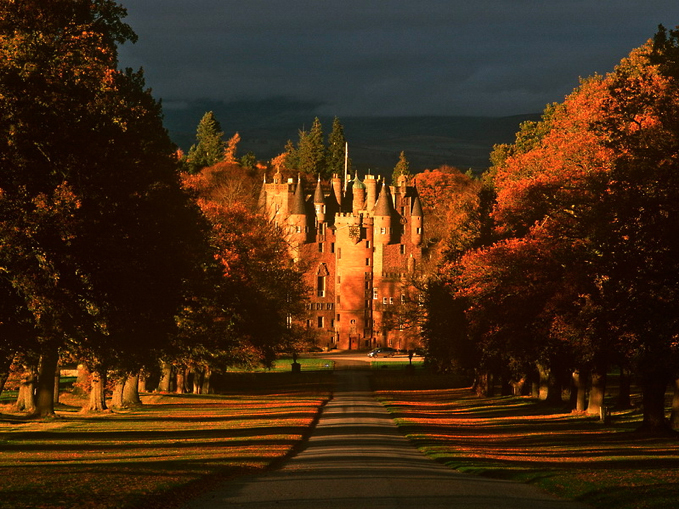 It has been the home of the Lyon family since the 14th century, but most of the existing Glamis Castle with its conte de fées turrets dates from the 17th century. It was the birth place of Princess Margaret, the second daughter of the Queen Mother. Shakespeare's Macbeth is Thane of Glamis, before becoming Thane of Cawdor, then King of Scotland. 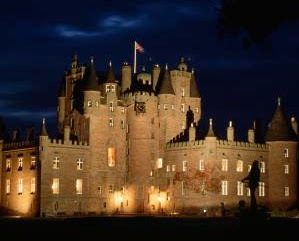 Historically however, there is no connection between the real King Macbeth and Glamis Castle. There are many legends and ghost stories regarding this fine castle. One of those recorded is of the Monster of Glamis, a terribly deformed child of the family whose parents apparently preferred to have it locked away in secret rooms, the doors of which were finally bricked up after the 'monster' had died. Another version is that to each generation of the family was born a vampire child, and each one was successively walled up, again in a secret room. It's also said that in a bid to discover the secret suite, sheets or towels were hung from all the windows of every room of the castle. Yet from the outside there were several windows without sheets, the rooms of which could never be found. There is also the historically true story of the Ogilvies. Somewhere within the thick walled castle allegedly exists the room of sculls. The Ogilvie family, seeking refuge from their enemies, the Linsays, were also walled up in such a room where they died of starvation. Alexander Lindsay, the fourth Earl of Crawford, otherwise identified as Alexander Lyon, second Lord Glamis, was familiarly known as Earl Beardie. He was reputed to have been 'a thoroughly wicked laird'. Legend has it that during a card game with acquaintances, he was losing badly. It happened to be the Sabbath, and his friends tried to persuade him to stop playing, but Beardie grew so angry that he swore he would continue to play until doomsday, or even with the Devil himself. The oath was enough to cause the apparition of a stranger who immediately dismissed Beardie's acquaintances, sat down opposite the Earl, and calmly dealt out the cards. This is also thought to have taken place in a secret room, where, out of time, one imagines the Earl of Crawford is still situated, condemned to play cards with the devil, until the day of judgement.